Animated Flash shorts based on the light novel series "Haiyore! Nyaruko-san." 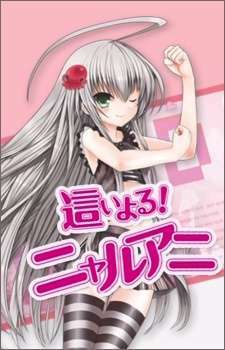 In these shorts, Nyarlko, an anthropomorphized female version of Nyarlathotep from the Cthulhu Mythos, is constantly being told off by Mahiro, a normal human boy, for all the crazy or stupid things she does. In one of the shorts, Nyarlko is drawing a cover design for a body pillow. It turns out that the pillow's subject is a half-dressed Mahiro in what appears to be a hot and heavy scene with Nyarlko. Naturally, Mahiro proceeds to stab Nyarlko in the hand with a fork and threatens to kill her if she releases the pillow design. Other shorts revolve around various gags and occasionally feature Cthuko, an anthropomorphized female version of Cthugha, who's madly in love with Nyarlko.